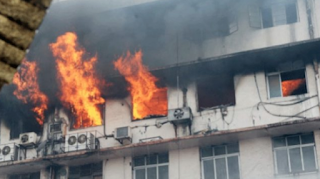 Data and equipment were lost in a fire that broke out at the data centre of the Economic and Financial Crimes Commission (EFCC) in Wuse 2, Abuja, on Monday night. In a statement released on its Facebook page, the commission said the inferno “almost razed down” the building. “The fire started at the former newsroom which now serves as storage for ICT equipment that were retrieved from the Commission former offices scattered across the Capital City,” the statement read. Men of the Federal Fire Service led by Melone Onyekachi, sector commander, were able to successfully curtail the extent of the fire after receiving a call from Kayode Oyetunde, incident duty officer of the commission, at 7:10pm. While receiving members of the Christian Association of Nigeria (CAN) on Friday, President Muhammadu Buhari had said that he has asked the commission to account for all the money it has recovered.